EARLY morning on the South Traverse. 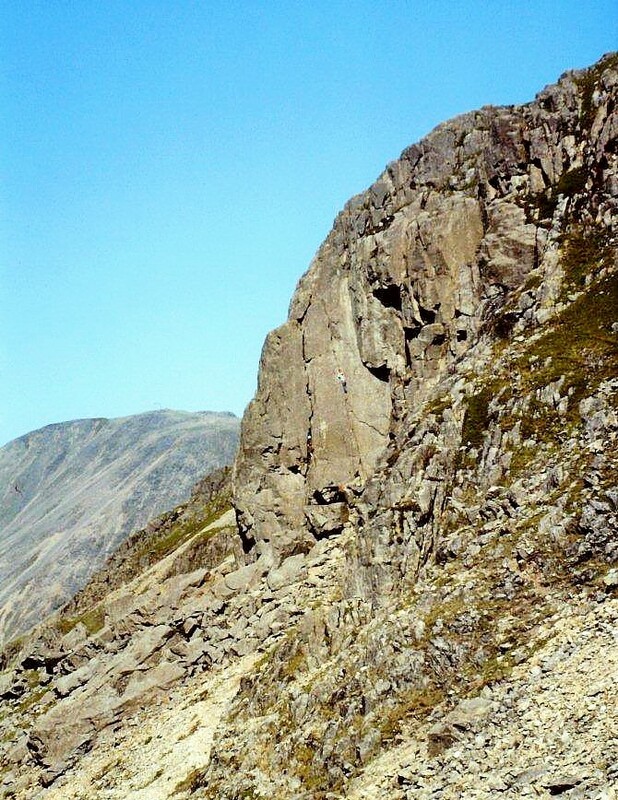 The southern crags of Great Gable soak up sunlight. Rocks are warm to the touch beneath their volcanic tuff roughness and crumbly lichen. In the air, the bleat of a distant ewe and the clink of karabiners; an occasional laugh; an unfurling of ropes. This is a place of pilgrimage, a craggy paradise where climbers have sought adventure since Victorian times. This is Lakeland in its grand and gritty glory . . . I sit in the sun beneath the vertical crags of Kern Knotts and watch a man inch his way up a cleft in the face, his companions paying out rope from below. I’m not a climber, never have been. But I harbour a deep admiration for anyone who has the nerve and self-control to place his existence in the tenacity of his fingertips and toes. Click. I capture the climber for ever with my Zenit E and telephoto lens. He is immortalised in Kodachrome. That one delicate move – left leg ascending, right leg taking the strain – has been frozen in time. It’s a window into one man’s life on a perfect morning in the summer of 1978. I leave Kern Knotts and scramble along the South Traverse, the climbers’ path that skirts beneath Great Gable’s buttresses. 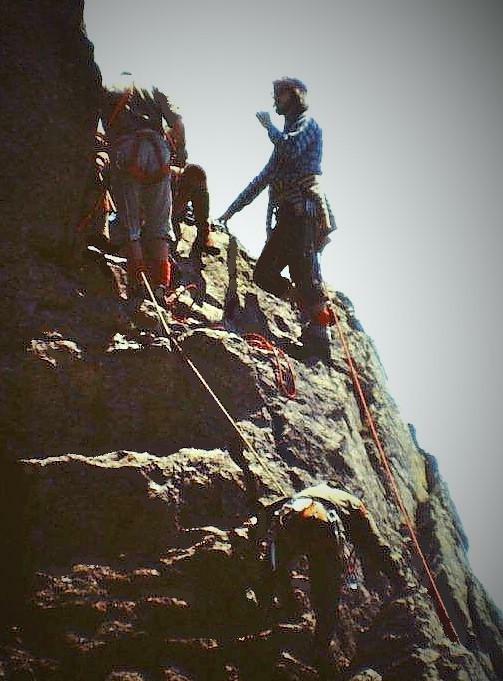 More climbers are ascending Napes Needle. One is standing on the very pinnacle, taking in slack. Out comes my Zenit. A fumble of lenses. Click. Another moment in time is held in suspension. Climbers chatting on a ledge, one of them having a smoke. Click. A satisfying drag on an Embassy Regal or Players No6 is snatched from the present and filed for future use. Then I continue my walk to Beck Head, the shoulder between Kirk Fell and and its mightier neighbour, and crunch up the rubble path to the summit of Gable. 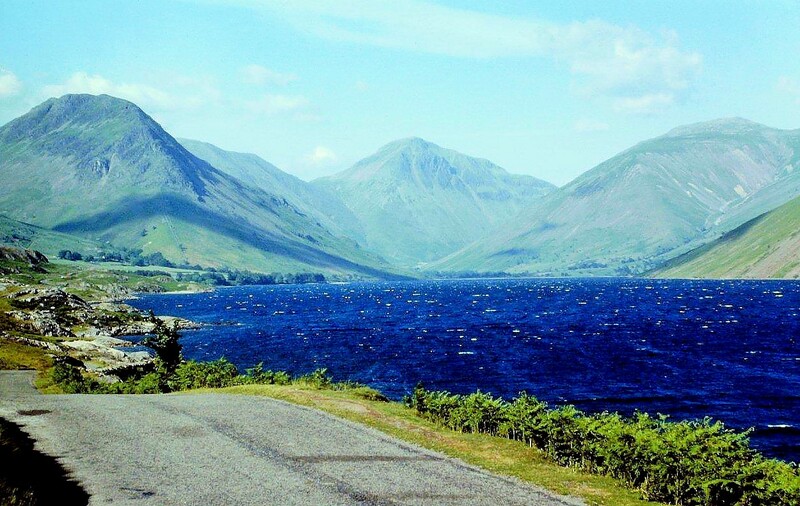 Views disappear into the blue-grey heat haze – views along Borrowdale, Wasdale and Ennerdale. Then I descend to Styhead Tarn and plod down the dusty track to Wasdale Head and a shady tent in the paddock outside the pub. Now, nearly 37 years on, I look at these pictures and wonder what became of those men and women, those agile young climbers. They’ll be in their late fifties and sixties, with children and grandchildren, and lives that have probably turned several sharp corners over the decades. What do they do at weekends, those people? Mow the lawn? Polish the car? Take a one-way tour of Ikea in search of table lamps to match the bedroom curtains? Or are they still out there on the hills? Not captured in time like these fading transparencies, but still crunching up mountain paths? A shade greyer, perhaps; hair thinner; not quite so slender; a little less agile; but still indulging that keenness to climb and explore wild places? 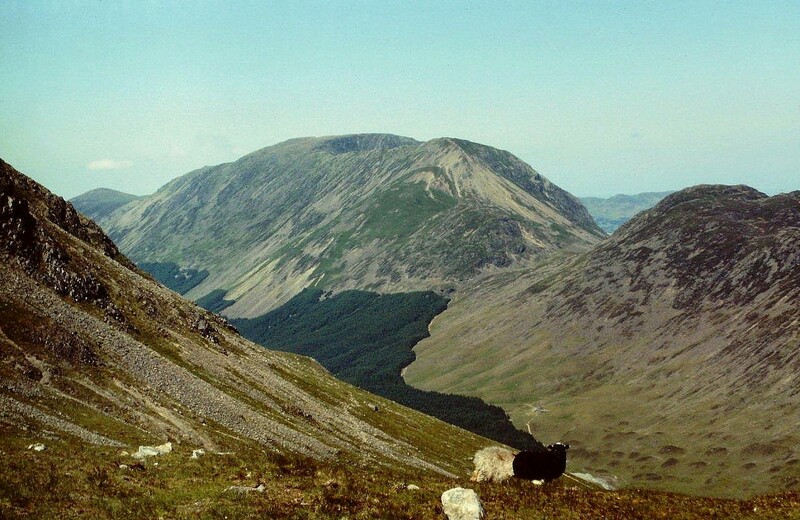 The past was glimpsed on Great Gable’s South Traverse in June 1978. 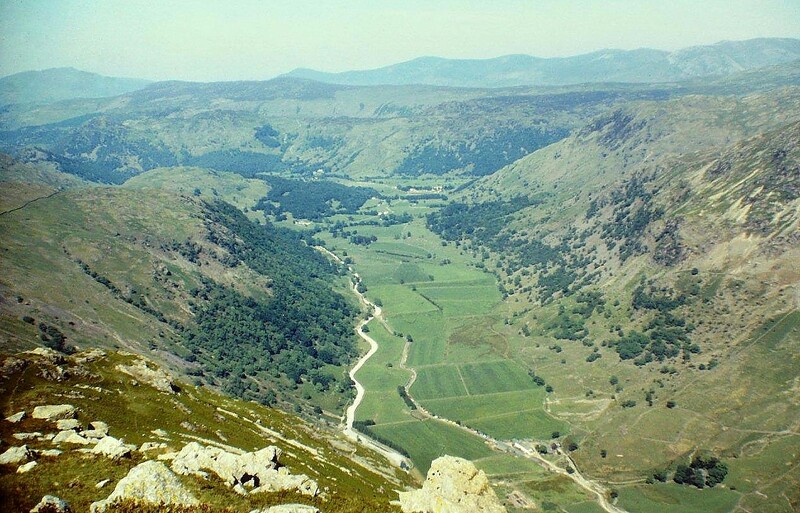 This entry was posted in Camping, Climbing, Footpaths, Geology, Hiking, Life, Mountains, Napes Needle, Tarns, Walking, Weather and tagged Cumbria, Lake District, outdoors, The Lakes. Bookmark the permalink. Another great and moving post Alen. Substitute fell running for rock climbing and I am one of those guys…. And yes, I am still getting out there. In the Lakes this weekend visiting some old haunts and watching some fell runners doing what I used to do all those years ago! Hi Andy. It’s good to know people are still going strong after all those years. Have a great weekend! I used to enjoy climbing in that area Alen. The ground drops away from the base of the climbs quite steeply which gave the routes that big mountain atmosphere. 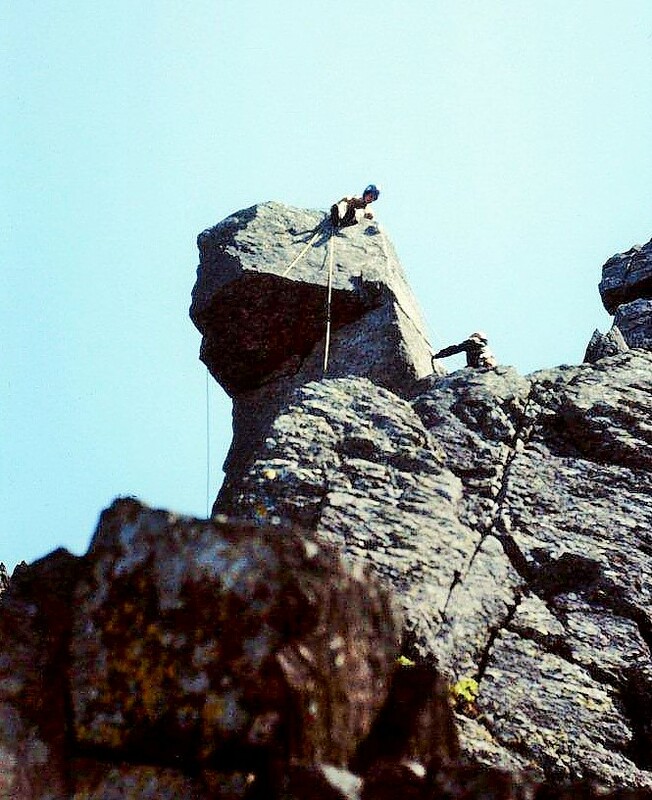 Four of us did Napes Needle on the 14th March 1991. We then did the ridge behind and then found a scramble up towards the summit of Gable. The weather stood out in that it was hot and sunny as well. Talking about people still enjoying the hills in old age. We met a Scottish guy at the weekend in his mid seventies at Coldedale Hause. He was struggling along with a limp so I stopped for a chat. He told us he found it a bit harder to get around nowadays. Thinking it was an age thing I said well none of us are getting any younger. He then rolled up his trouser leg to show a mangled looking limb. Turns out he had badly broken his legs in a pit accident years ago. One thing for certain he was determined it wasn’t going to stop him. It’s great meeting characters like that in the hills. Hi David. You’re a braver man than me. I got half-way up the Needle once (again late-70s), but I was on my own and the only reason I didn’t progress any further was because my dog wouldn’t stop barking until I retreated. He probably saved my life – or from the acute embarrassment of being stuck up there. 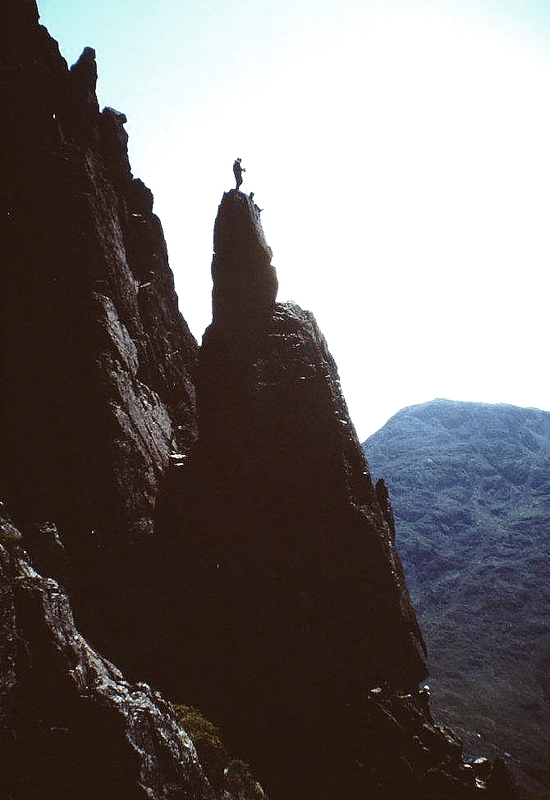 I wouldn’t even dream of climbing it these days – not even with a proper team and equipment. You’re right about the big mountain atmosphere. I’ve scrambled up the gulleys and screes between the crags to the summit. It’s a wonderful mountain is Gable. Probably my all-time favourite in the Lakes. That’s a very inspiring tale about the old fellah. I hope we’re all still going with the same determination when we reach his age. 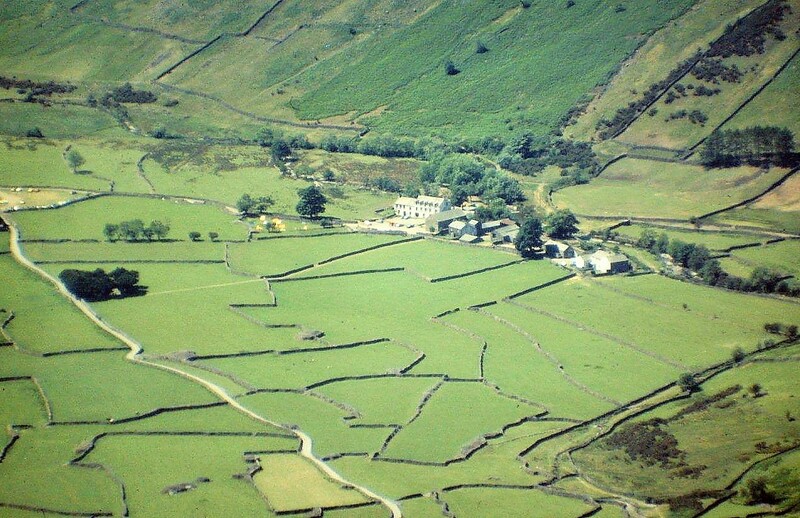 Alen, I was there, if not on that date then around that time, climbing on those crags and sitting on the top of Napes! A wonderful area, wonderful memories! Hi Charles. 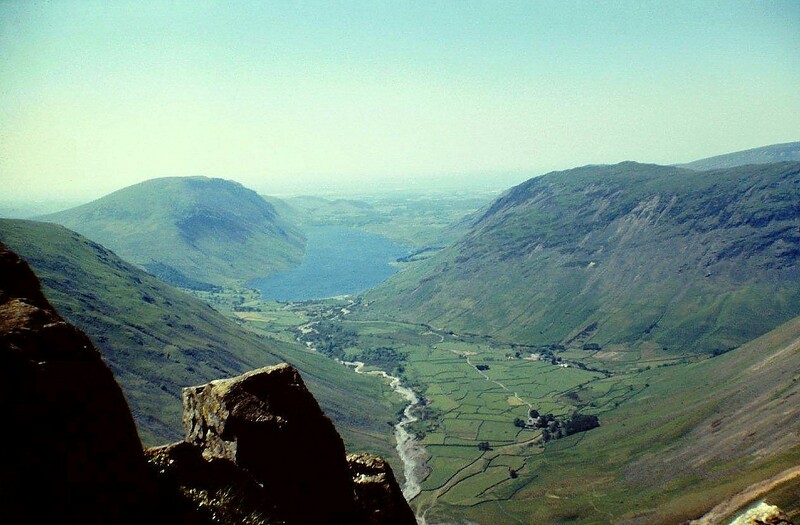 I spent many weekends in Wasdale during that period and had many a chat with climbers and walkers, and shared a good few pints with them in the Wasdale Head Bar. There’s a good chance our paths have crossed! Were you that chap who poured his pint down my leg? I would have remembered that. Love these old photos, and yes, as others have commented, there are people still climbing into their 60s. 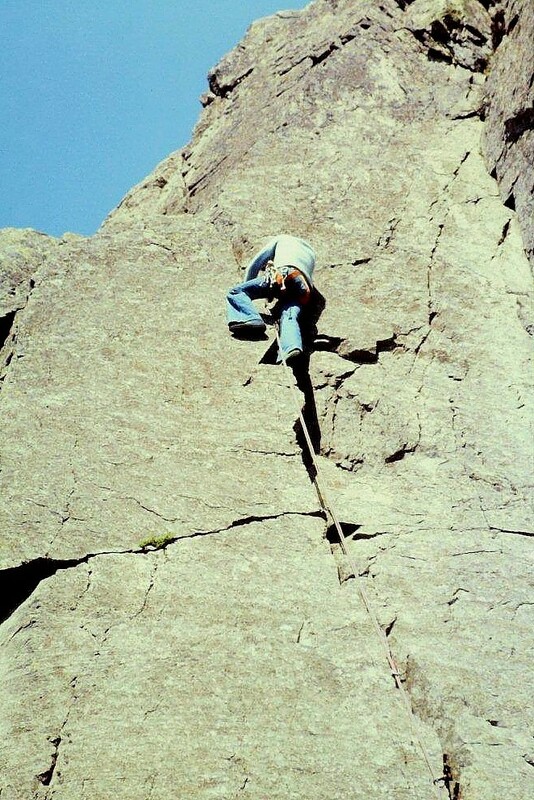 I save my(very occasional) climbing for the very easy stuff – these pics make me nervous just looking at them. Hi Anne. Good to hear from you. Yes, there appears to be a healthy number of the older generation out there on the hills – and I find that very reassuring as I approach the big Six-Zero. Lovely post, Alen. I wonder how photography has changed the whole way we relate to our lives and the past. Not that long ago, the image of the minute past was really gone for ever except in memory, so would people have tried harder to really remember detail, or written diaries if they were literate, or just felt their lives vanishing behind them? Good thing? Bad thing? Or just different thing? Ah, Mrs Potter, that sort of question would take an entire post to answer. In the short term I would say “different thing” because pictures complement words, whereas memory disappears with the final breath – or earlier. 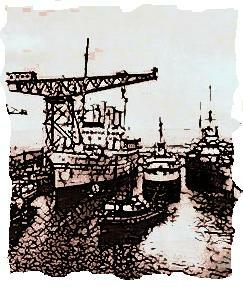 I’ve taken photographs since I was a teenager, so I have a sort of pictorial diary stretching back to the early 70s. And I’m glad I did because I’m forever coming across pictures of events that would otherwise have completely disappeared from memory. Interesting how our attitudes to photography have changed, though. Only this week I’ve been digitising (horrible word) family photographs dating back to the Victorian period. My forebears (and yours too, no doubt) dressed in their Sunday best to have their pictures taken. A family photograph was a formal event involving ornate stage props, velvet curtains and improbable backdrops. The modern equivalent, if it exists, can be deleted at the press of a button, so what sort of legacy will tomorrow’s grandchildren inherit? Perhaps we will go full circle to relying on memory. 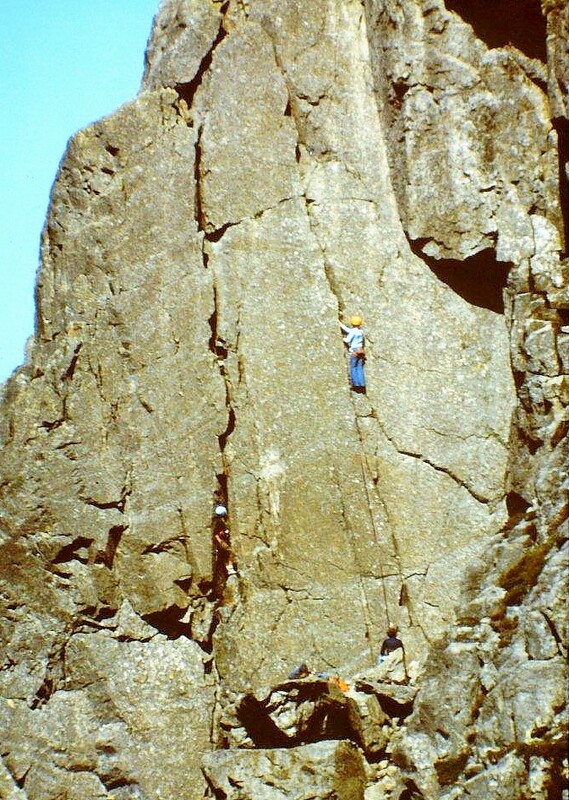 I’ve heard Bill Birkett saying the top bit of Napes Needle moves, and some climbers get to the top and make it rock about! As if it’s not treacherous as it is. And if Jos Naylor is anything to go by I’m sure there’ll still be a lot of vintage climbers out there, perhaps a little slower, but still dangling by their fingernails off some slab of granite somewhere. Hi Chris. That’s like when you get in a rowing boat on a park lake – there’s always one nerd who rocks it for a laugh. But you’ve jogged my memory now. There was a famous rocking stone somewhere on a mountain – I think in Scotland – and someone rocked it too much and it rolled all the way down. End of the famous rocking stone. I’ve always been a big fan of Jos Naylor. Great bloke, and still going strong. Hi Carol. You can bypass the Needle very easily underneath it. Threading the Needle means passing through the crux between the Needle and the crag, which is an easy scramble. I’ve done that a couple of times – once with my son when he was ten. There’s nothing really dodgy on the whole traverse because the paths are good and there’s always plenty of choice on how to proceed. 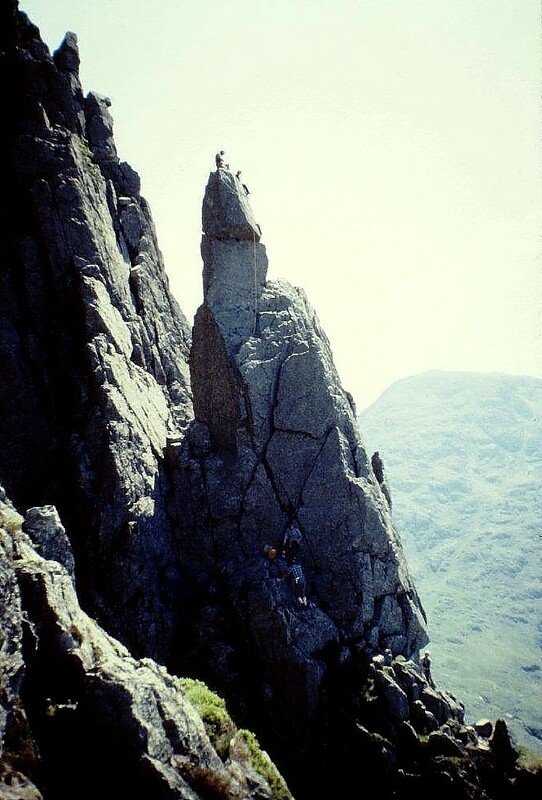 The photos of the Needle were taken from the Dress Circle, which is the route across the neighbouring crag and is part of the traverse. It’s not as bad as it looks. Honest. It’s not really the scrambling which bothers me – it’s the big drop underneath it all! But it’s not vertical. You might roll for a while, admittedly. that would be pleasant… NOT! Beautiful and thoughtful post, Alen. I think that once you’ve got an eye for nature and felt in every fibre of your body how joyful it is to climb and hike you will always yearn for it. Your body will remember. Hej Hanna. You are absolutely right. I look at these pictures now and I want to be up there with the sun burning the back of my neck and the wind in my hair. It’s the yearning that keeps us going. 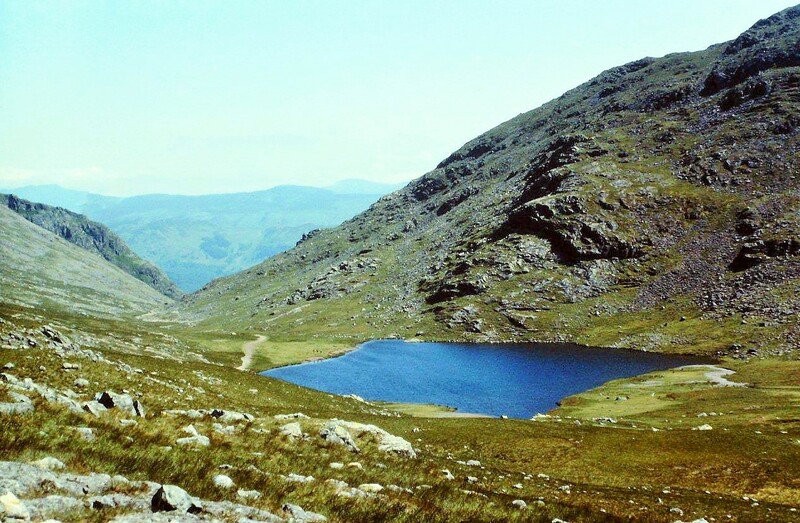 In my adult life, I’ve never set out on a walk in the Lakes that hasn’t had a summit as its ultimate aim, but if time, circumstance and my ever more painful knees allow me a return to the fells, the South Traverse, linked to the North, would be the most tempting breach of that record. Great post, Alen! That pinnacle makes me feel dizzy just to look at it. It must be exhilarating to climb up there. I’ve sometimes had a crazy impulse to climb (though not as extreme as that!) and then I remember I’m not keen on heights. I really hope those climbers are still out there, stretching their limits instead of mowing the lawn. Loving the flared jeans as well! Hi Jo. Yes, the general consensus is that all the oldies (I’ll include myself just out of courtesy) are still up there and hard at it, as well as mowing the lawn. That can’t be a bad thing. I was expecting the flared jeans to have been a bit of a talking point but you’re the first to mention them. I can’t imagine they were very comfortable for climbing. A bit tight from the knees and upwards, I would have thought. What a thrilling post! If only I wasn’t such a coward… ah! Hi Lily Lau. It’s not neearly as scary as it looks.